This data set provides an estimate of the spatial and temporal extent of surface water at 250-m resolution over nine years (2003-2011) for the African Sahel region (10-20 degrees N) using imagery from the Moderate-resolution Imaging Spectroradiometer (MODIS). Water bodies were identified by a spectral analysis of MODIS vegetation indices with the aim to improve existing regional to global mapping products. This data set can be used to enhance the understanding of Earth system processes, and to support global change studies, agricultural planning, and disease prevention. These data provide a gridded (250-m) estimate of the number of years (during 2003-2011) that a pixel was covered by water. The data are presented in a single netCDF (*.nc) file. Figure 1. 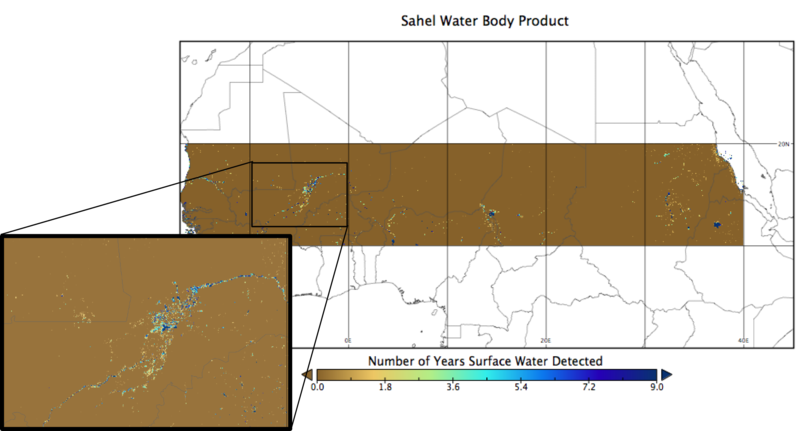 The Sahel Water Body Product records the number of years from 2003-2011 that each 250-m pixel was covered by water. Inset shows ephemeral waterways in Mali. Two companion files are provided: a binary text file (swbp.bin) that contains the same gridded data as the netCDF file, and an R script (read_swbp.R) that can be used to read and plot both the netCDF and binary data. Investigators: Armel Kaptue (armel.kaptue@sdstate.edu), Niall P. Hanan and Lara Prihodko, South Dakota State University. This data set provides an estimate of the spatial and temporal extent of surface water at 250-m resolution over nine years (2003-2011) for the African Sahel region (10-20 degrees N) using imagery from the MODIS sensor onboard NASA's Terra and Aqua platforms. Water bodies were identified by a spectral analysis of MODIS vegetation indices with the aim to improve existing regional to global mapping products. This data set can be used to enhance the understanding of Earth system processes, and to support global change studies, agricultural planning, and disease prevention. These data provide a gridded (250-m) estimate of the number of years (during 2003-2011) that a pixel was covered by water. Grid cells at 250-m resolution. The data set covers the period 2003-01-01 to 2011-12-31. The data represent the total number of discrete years (over the nine year period 2003-2011) where a pixel was estimated to contain surface water. The data are presented in a single netCDF (*.nc) file. Grid cells with no data (fill value or missing values) are represented by “10”. read_swbp.R script for R language Example script to read in data from the binary file and from the netCDF file and to manipulate and plot them on a map. Water is a precious resource in arid and semi-arid regions like the African Sahel where permanent surface waters are rare and hydrological solutions (e.g. accessing deep aquifers) are often not feasible. This data set provides an estimate of the spatial and temporal variation of surface water extent at 250-m resolution over nine years (2003-2011) for the Soudan-Sahel region using visible and infrared imagery from MODIS from both Terra and Aqua platforms. The methodology is automated and could be applied to other regions and sensors. The investigators utilized a combination of two MODIS spectral indices: the Normalized Difference Vegetation Index (NDVI) and the Modified Normalized Difference Water Index (MNDWI). Accuracy assessments carried out on 743 lakes across 37 Landsat images selected in Sahelian Africa on the basis of a stratified sampling show that the Sahel Water Body Product is (i) reliably able to detect surface water bodies of approximately 50 ha and larger, (ii) improves on existing surface water body products and (iii) can be used to monitor the seasonal distribution of surface water in semi-arid regions. See Kaptue et al. (2013) for additional details. An initial quality assessment of SWBP was first carried out using 37 wet season (July-October) LANDSAT ETM+ SLC-ON scenes with 30-m spatial resolution selected across the study region using a stratified sampling approach based on the WRS-2 grid (see Kaptue et al. 2015 for additional details). Accuracy was also measured by comparison with existing surface water products for the same region, including: the Global Lakes and Wetlands Database (GLWD; Lehner and Döll, 2004), the University of Maryland land water mask (UMD; Carroll et al., 2009), the Shuttle Radar Topographic Mission Water Body Data map (SWBD; Slater et al., 2006), and the Temporary Small Water Body map (TSWB; Haas et al., 2009) from SPOT/VEGETATION. SWBP showed the highest agreement with GLWD and TSWB, covering ~83% of areas of high agreement (Figure 5 in Kaptue et al. 2013). The evaluation of the derived maximum water surface extent shows satisfactory results in comparison with Landsat imagery and also in comparison to the existing products. See Kaptue et al. (2013) for additional details. The focus of this study is a transition zone in Africa delineated by the latitudes 10 degrees N and 20 degrees N and the meridians 20 degrees W and 40 degrees E here referred to as the Sahel region. In this analysis, we calculated a time series of modified normalized difference water index (MNDWI) over the 2003-2011 period from each 16-day NBAR (nadir bidirectional reflectance distribution function adjusted reflectance) image from the MODIS instrument. The MNDWI data were upscaled from 500 m to 250 m in order to correspond with the higher resolution of MODIS NDVI data. Then, the information provided by the QA flag of the NDVI product was used to identify continental pixels and poor quality NDVI data. Because spectral indices have dissimilar performances in identifying Sahelian water bodies in this study, the investigators used a combination of the NDVI and the MNDWI. A pixel was identified as a water body if NDVI < 0 and MNDWI > 0. Each image of the time series (~205 NDVI and ~205 MNDWI images over 9 years) was stratified into two classes: one of non-water features and another of water bodies. A cell which was flagged as water in each of the images was considered perennial whereas if a cell was only flagged as water during the rainy season it was considered ephemeral. Annual water body detection was achieved by flagging each cell as open water or not and summing through each calendar year. For instance, a pixel value of one in the annual water body product indicates that for that specific location the pixel was flagged as a water body only during one year. Finally, the yearly information was synthesized to produce the new Sahel Water Body Product. A full description of the procedure and analyses of results are provided in Kaptue et al. (2013). Carroll, M.L., J.R. Townshend, C.M. DiMiceli, P. Noojipady and R.A. Sohlberg. 2009. A new global raster water mask at 250 m resolution. Int. J. Dig. Earth, 2:291-308. doi:10.1080/17538940902951401. Haas, E.M., E. Bartholome, and B. Combal. 2009. Time series analysis of optical remote sensing data for the mapping of temporary surface water bodies in sub-Saharan Western Africa. J. Hydrol., 370:52-63. doi:10.1016/j.jhydrol.2009.02.052. Kaptue A, Hanan N, Prihodko L. 2013. Characterization of the spatial and temporal variability of surface water in the Soudan-Sahel region of Africa, Journal of Geophysical Research, doi: 10.1002/jgrg.20121. Lehner, B., and P. Döll. 2004. Development and validation of a global database of lakes, reservoirs and wetlands. J. Hydrol., 296:1-22, doi:10.1016/j.jhydrol.2004.03.028. Slater, J.A., G. Garvey, C. Johnston, J. Haase, B. Heady, G. Kroenung, and J. Little. 2006. The SRTM data “finishing” process and products. Photogramm. Eng. Remote Sens., 72:237-247.